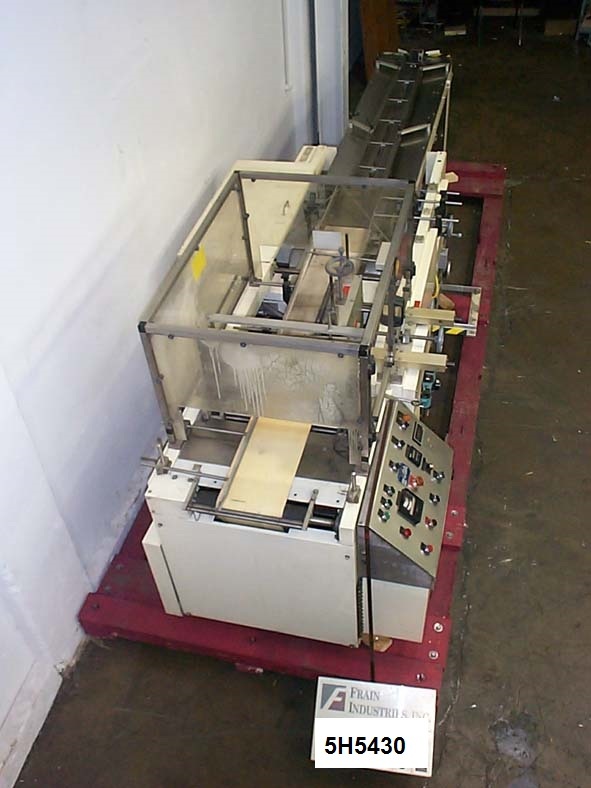 Looking for a used shrink wrap machine for sale? You’ve come to the right place. Shrink wrapping is sometimes used as the primary packaging. Some individual foods, soaps and other products may be wrapped directly. More commonly shrink wrapping is used as a secondary or tertiary packaging. An example of secondary use is shrink wrapped six-packs of beverage cans or 24 pack bundles of water. Wrapping is also commonly used as a tertiary packaging such as overwrapping an individual carton or bundle of cartons. In the past, appearance of the tertiary packaging has not been considered critical important as the customer never saw it. The rise of club stores like Costco and Sam’s Club has changed this. The 6 pack of canned corn is now the unit of sale in these stores and appearance has become critical to branding. Previously translucent grey film was fine since nobody outside of the stockroom was likely to see it. Now, glossy film with registered graphics is needed to catch the customer’s eye using bullseye or end seal wrapping. This affects the choices of machinery that can be used. Download the complete Shrink Wrapping Whitepaper to continue learning about different types of wrappers. One important consideration when selecting the proper a shrink packaging machine is the type of shrink package that is desired around the product. L-bar sealer shrink packaging equipment forms a film seal around a product that has three side seams, one the front of the package and one on each side of the package. Flow thru shrink packaging equipment forms a shrink film package from a single roll of shrink film that has an overlapped shrink film seal underneath the package and a cross seal on the front and back sides of the package. Shrink bundler packaging equipment forms a shrink film package around the product from two rolls of shrink film which has cross seam across the front and back sides of the package and openings in the film package on the left and right sides of the package. Once a product has been wrapped in shrink film, the product passes through a heat shrink tunnel. The heat from the heat shrink tunnel causes the film to shrink around the product forming a tight package around the product. Browse our used shrink wrap machines for sale or contact Frain today to discuss your project. American Film & Machinery Model WSN-GEN-2M stainless steel, steam shrink tunnel and conveyor with self contained steam generator and number of containers per minute – depending on materials and application. Can handle middle or full body and cap shrink applications with materials of PVC, PETG, OPS and PLA and a wide range of round, square, oval and other irregularly shaped containers. Equipped with 1 zone and 2 tier shrink steam tunnel with 5-1/4" wide x 8" high total aperature x 79" long tunnel with multiple steam zones and adjustable manifold with direct steam heat, 4-1/2" wide x 128" long stainless steel table top product conveyor has 36" in feed and discharge height hand crank adjustable to + / – 2", with A/C vari-speed controller. self contained 20KW electric steam boiler, with 50 psi, internally plumbed and steam pressure controls, drip pan for condensation recovery has a maximum operating temperature of 212° F, with temperature gauge and adjustable manifold for direct steam heat and steam pressure of 3-4 Kg/cm2 with 43 to 57 psi and dual top 3-3/4" OD steam exhaust, hot and cold water in / output ports with consumption rates of 200 litres or 52 gallons an hour. Mounted on stainless steel frame with casters and leveling legs. Texwrap Model ST-3322 /1322, automatic, right to left, inline, L-Bar sealer with closing conveyor and shrink tunnel rated from 20 to 100 feet belt speed per minute with number of packages – depending on materials and application. Package size range: 2" to 32" in Length; 2-3/4" to 19.5" in Width; up to 10.5" in Height. Equipped with 46" long x 19" wide in feed conveyor, with auto space staging sysytem, 33" long x 22" wide seal bars and has (3) 49" long x 6" wide pneophreme closing and discharge conveyors with safety guarding. Film specs: center fold film up to 28" in width, with 32" long film rolls on 2" OD cores with perf wheels and scrape winder. Control panel has A/B controller with swing arm touch pad controls and readout with cross seal eye horiz, vert, and both control switch, manual seal reset and start, stop, e-stop push buttons with VFD A/C motor drives. Texwrap Model T-1322 single zone shrink tunnel has 13-1/2" in Height; 22" in Width total aperature and 42" in Length heat chamber Equipped with 15-1/2" wide x 66" long stainless steel mesh product belt conveyor single top mounted blower. Control panel has tempature controller up to 400° F, variable speed conveyor dial, main machine, heater and conveyor on / off switches and variable velocity air flow controller. Both mounted on (4) leg base frames with casters and leveling legs. Arpac Model TS37/VT122272, flow thru, side seal shrink wrapper and tunnel rated from 0 to 90 feet per minute or up to 80 packages per minute – depending on materials and application. Shrink wrapper product size range: seal bar in vertical position: 3-1/2" to 60" in Length; 2" to 7.5" in Width; 2 to 12" in Height; seal bar in horizontal position: 3-1/2" to 60" in Length; 2" to 16" in Width; 1/4" to 7.5 in Height. Equipped with 44" long in feed conveyor, adjustable former, pull out film carriage, adjustable side seal assembly, 13" walking beam seal jaw and discharge conveyor. Features include scrap removal and perf wheel, status light bar, interlock safety guarding A/B PLC with panel view. Film specs: single-wound; to 39" in width; to 12" in diameter on 3" core. Convection shrink tunnel: total aperture: 13" in Height; 25" in Width; and has workable Aperture: 12" in Height; 22′ in Width; 72" in Length. Equipped with 96" long mesh conveyor, with illuminated shrink chamber and chamber viewing window, variable speed controls, (3) top and bottom blowers, temperature and upper / lower air velocity controls. Both Mounted on base frames with casters and leveling legs. Great Lakes Model TS37, automatic, continuous motion, flow thru, horizontal side seal shrink wrapper rated from 20 to 70 packages per minute – depending on materials, application and machine configuration. Size range: 4" to infinite in Length; up to 16" in Width; up to 6" in Height. Equipped with 9′ long flighted infeed conveyor on, central lube system, hole punch and scrap removal system. Maximum film: 14" in diameter; 37" single wound film width. Cross seal jaws can be rotated 90 Deg to run effective 6" wide by 12" high. Includes Great Lakes 60" long shrink tunnel. Aperture:10" in Height; 22" in Width. Conveyor 20" W by 72" L. Rated from 0 to109 feet per minute. Arpac Model TS37/VT122272, flow thru, side seal shrink wrapper and tunnel rated from 0 to 90 feet per minute or up to 80 packages per minute – depending on materials and application. Shrink wrapper: Product size range: Seal bar in vertical position: 3-1/2" to 60" in Length; 2" to 7.5" in Width; 2 to 12" in Height; Seal bar in horizontal position: 31/2" to 60" in Length; 2" to 16" in Width; 1/4" to 7.5 in Height. Equipped with 72" long in feed conveyor, adjustable former, pull out film carriage, adjustable side seal assembly, 16" walking beam seal jaw and discharge conveyor. Features include scrap removal and perf wheel, status light bar, interlock safety guarding A/B PLC with panel view. Film secifications single-wound; to 39" in width; to 12" in diameter on 3" core. Convection shrink tunnel: Total aperture: 13" in Height; 25" in Width; Workable aperture: 12" in Height; 22′ in Width Tunnel: 72" in Length. Equipped with 96" long mesh conveyor, viewing window, illuminated shrink chamber, variable speed controls, (3) top and bottom blowers, temperature and upper and lower air velocity controls. Both mounted on base frames with locking casters. Great Lakes Model TS37. automatic, continuous motion, side seal, horizontal wrapper. rated from 10 to 70 packages per minute – depending on materials and application. Product size range up to: 16" in Width x 6" in Height x 4" to infinite in Length. Cross seal jaws can be rotated 90 Deg to run effective 6" wide x 12" High. Maximum of 37" web width allowing approx 6" for side seal trim and shrinkage. Maximum film roll diameter of 14" and maximum of 37" single wound film width. Control panel has GE Fanuc series 90-30 programmable controller, manually adjustable height and width side seal, slide out film carriage, 10′ lugged in feed conveyor (currently set on 16" centers). with hollow pin chain to adjust center distance, scrap take up wheel, no product detector, (4) perforation wheels, and operator shielding. Mounted on heavy duty base frame. Conflex Model CW160, automatic, mechanical, continuous motion, shrink wrapper and lap sealer, rated up to 100′ per minute with number of product – depending on materials and application. Package size range: 3" to 36" in Length x 2" to 15" in Width x 1/8" to 5" in Height. Equipped with 72" long lugged chain in feed set on 16" centers with 16" wide seal jaws and bottom static lap seal, heated rotary knife cut off, pin wheel perferator, vacuum transfer belt, powered film unwind and vacuum pump. Maximum film width of 34" Maximimm roll diameter of 13". Control panel has jaw heater controls and start, stop, e-stop push buttons. Mounted on base frame heavy duty base frame. Fully automatic stainless steel up stacking shrink bundler rated from 10 to 25 bundles per minute – depending on materials and application. Bundle size range: to 11"L x 17 1/4"W x 9.5"H. Maximum film width: 24". Features: 19 3/4" (W) in-feed w/an automatic up stacking collator. Heat tunnel aperture 28" (W) x 14" (H) and length of 40". Additional features Allen Bradley plc with an Allen Bradley Dataliner display, Siko gauge on width adjustment, adjustable seal bar timer, temperature control, and tunnel temperature, low film sensors, perforation knife for easy bundle opening, and a cooling fan. Left to right product feed. Mounted on casters and leveling legs for easy mobility. Last running bundled cosmetics. Set for polyethylene film to seal a bull’s-eye package. OAD: (L) 194" x (W) 50" x (H) 80"
Semi-automatic, flow-thru shrink wrapper capable of up to 120 linear feet per minute. Packages: (3" – 60")L x (2" – 16")W x (3/8" – 6")H. Has 18′ long dual chain adjustable lug in feed, 19" wide wire cross seal jaw, film perf wheel, 40" max film width, 34"L x 16"W vacuum transfer belt (forming box to cross seal), E-stop, Allen Bradley PLC, three temperature controllers, integrated vacuum pump, and barrier guarding with electrical interlock.